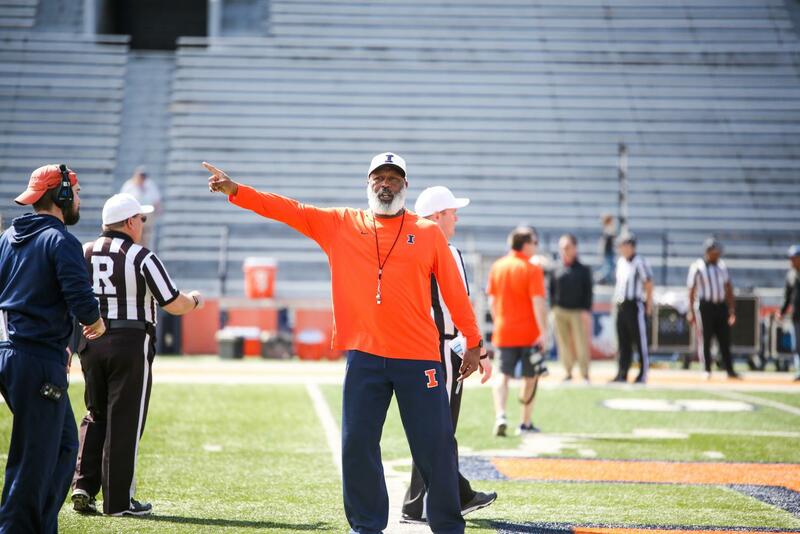 Lovie Smith leading spring practice on Saturday. 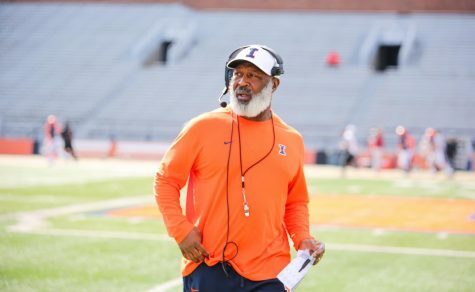 It may be head coach Lovie Smith’s fourth year in charge of Illinois football, but Saturday will mark the program’s first spring game with Smith at the helm. 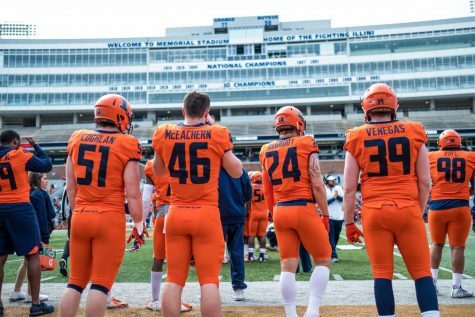 With three returning scholarship quarterbacks healthy and on the roster — a first since Smith has been in charge — Illinois finally thinks it has the depth needed to be able to have a true spring game. Though the atmosphere Saturday at Memorial Stadium will likely feel much more like a soft opening rather than a grand reveal of measured progress, the spring game is an opportunity for the program to celebrate recent recruiting momentum while assessing its available depth in a live-game setting. 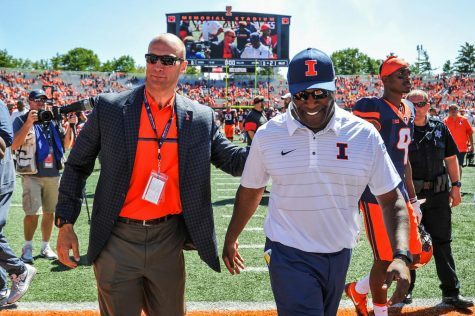 Offensive coordinator Rod Smith still thinks Illinois needs to add more depth and develop talent throughout the roster, but he thinks the program is in a better spot than when he arrived. 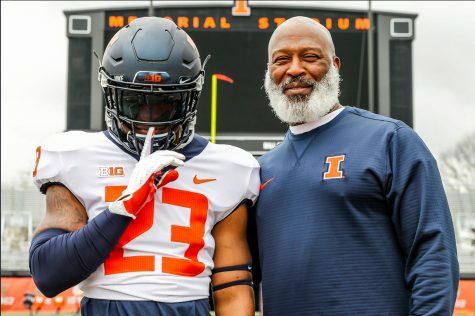 Newly minted cornerbacks coach Keynodo Hudson is eager to get a less filtered look at his group, which returns veteran junior Nate Hobbs and has a host of younger talent. 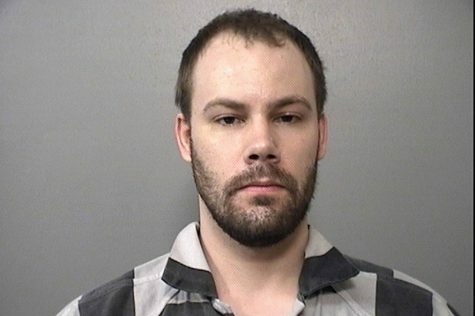 Hudson said Saturday will give the staff tape it can use to make evaluations for how players have progressed through the spring since the end of the season. While Hudson’s group has some compelling personnel questions that could be answered to an extent on Saturday, fourth-year wide receivers coach Andrew Hayes-Stoker wants to see someone emerge from his inexperienced crop of receivers. 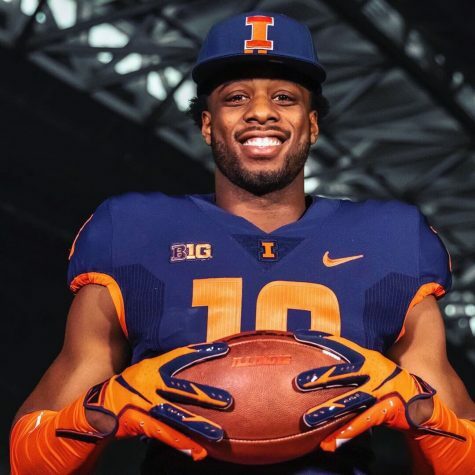 Illinois only returns one proven Big Ten receiver in soon-to-be junior Ricky Smalling, who led the team with 406 receiving yards and five touchdowns on 33 receptions. 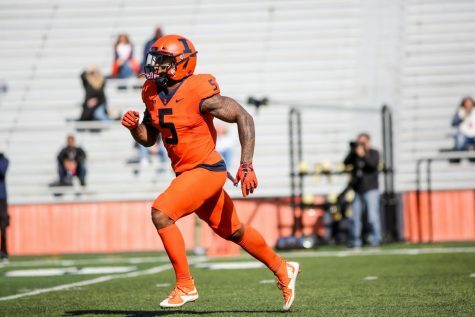 Smalling caught two touchdown passes against Penn State and had a season-high seven receptions for 72 yards and a touchdown at Northwestern, but Illinois struggled to find consistent production at receiver last fall after Mike Dudek went down with another season-ending injury. Hayes-Stoker said Smalling has showed the most in spring practice so far, but he was clear playing time is up for grabs. While nothing will be solidified after Saturday, he and other staff members will be taking careful note of how players perform. 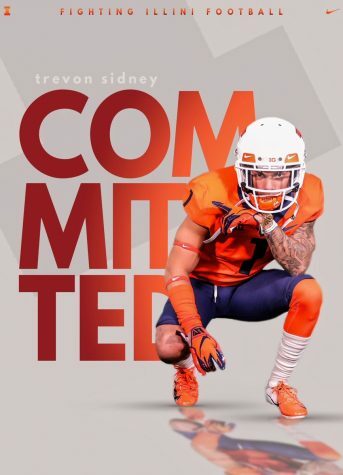 Illinois hasn’t had many opportunities to shine a positive light on the program over the last few springs, but the team’s Junior Day on Saturday featured more live ball than usual and the Illini got four commits in the ensuing days. 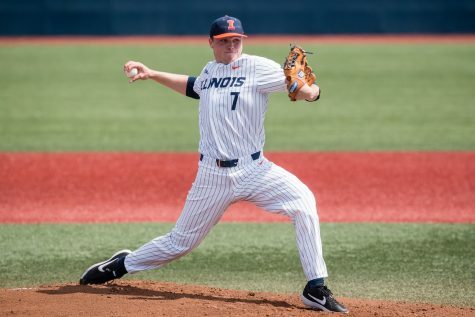 The program will once again be playing host to an ensemble of highly touted recruits and Illinois wants to give them something to look forward to and imagine themselves contributing to down the road. 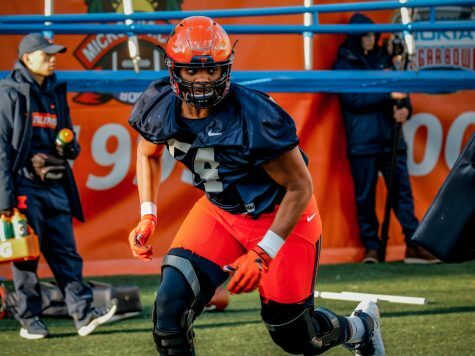 To make those good impressions and further the pitches to interested prospects, the Illini will look to showcase an offense more comfortable playing at Rod Smith’s high tempo and a defense that can improve from a disappointing fall.